In the Philippines, mining and aviation flourished almost at the same time during the American Colonial Period. Upon closer inspection, one finds that these two industries have histories that are, in fact, very closely related. The mining industry in the Philippines was started in the 1920s by American businessmen, who employed only a few dozen workers for their companies in Benguet. But when the Great Depression fell upon the United States, the American government decided to abandon the gold standard (the monetary system in which the standard monetary unit corresponds to a fixed weight in gold), and began acquiring gold at a much higher fixed rate of $35 per ounce. This move had an instantaneous effect on the Philippines’ mining industry. The high price of gold drove hundreds of foreign and local businessmen to invest in mining, and by 1935, mining had become the second most important industry in the colony. During these years, the Philippines became second top gold producer of the world, next to California. Because of the mining boom, businessmen Andres Soriano and Laurie Nielson became instrumental in developing the country’s aviation industry. Soriano, aide-de-camp to then President Manuel L. Quezon, founded Philippine Air Lines (PAL). Meanwhile, Nielson built the first principal airport in Luzon, right at the heart of Makati. The airport, which was inaugurated on July 17, 1937, was touted as the biggest and best equipped in Asia. Airlines like the Philippine Aerial Taxi Company and the Lopez-owned Iloilo–Negros Air Express Company (INAEC) operated from the Nielson Airport. In those years, most flights flew to and from mining areas in the Bicol region and Baguio City, or the Lopez sugar and coconut haciendas in the Visayas. 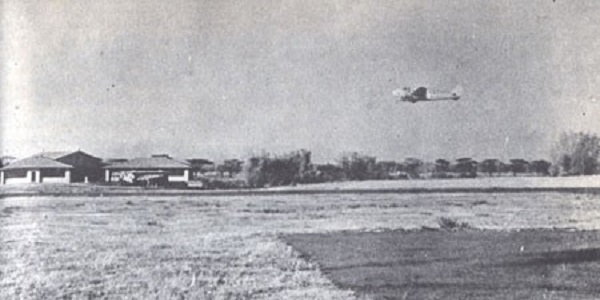 The first PAL flight on March 15, 1941, was also bound for Baguio City. More importantly, the improvement of Philippine civil aviation, along with military training, was regarded as a sign that the country was ready for independence. Photo: The first PAL flight to Baguio City, March 15, 1941. “Company History.” INAEC Aviation Corporation. http://www.inaec.com.ph/history.html. January 18, 2012. Finin, Gerard A. The Making of the Igorot: Contours of Cordillera Consciousness. Quezon City: ADMU Press, 2005. Henares, Jr, Larry M. “Don Andres Soriano.” Philippine Folio. http://www.philippinefolio.com/contdetail.php?id=17&id_app2=201&id_app3=01056. January 18, 2012. “History.” Marsman-Drysdale Group. http://www.marsmandrysdale.com/histhome.html. January 18, 2012. “Jun 5, 1933: FDR takes United States off gold standard.” This Day in History. http://www.history.com/this-day-in-history/fdr-takes-united-states-off-gold-standard. January 19, 2012. “Philippine Airlines, Inc.” Funding Universe. http://www.fundinguniverse.com/company-histories/Philippine-Airlines-Inc-Company-History.html. January 18, 2012. Quezon, Manuel L. “Sixth State of the Nation Address, January 31, 1941.” Official Gazette. http://www.gov.ph/1941/01/31/manuel-l-quezon-sixth-state-of-the-nation-address-january-31-1941/. January 18, 2012. “The Story of Acoje.” Acoje Mines. http://www.acojeonline.com/story_acoje.html. January 18, 2012.